Interactions between competitors, predators and their prey have traditionally been viewed as the foundation of community structure. Parasites - long ignored in community ecology - are now recognized as playing an important part in influencing species interactions and consequently affecting ecosystem function. Parasitism can interact with other ecological drivers, resulting in both detrimental and beneficial effects on biodiversity and ecosystem health. Species interactions involving parasites are also key to understanding many biological invasions and emerging infectious diseases. 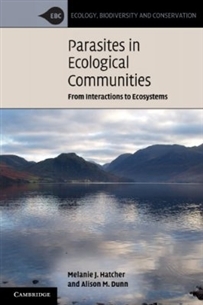 This book bridges the gap between community ecology and epidemiology to create a wide-ranging examination of how parasites and pathogens affect all aspects of ecological communities, enabling the new generation of ecologists to include parasites as a key consideration in their studies. This comprehensive guide to a newly emerging field is of relevance to academics, practitioners and graduates in biodiversity, conservation and population management, and animal and human health.